The Ford Focus has been around for over 20 years now having first launched in 1998. 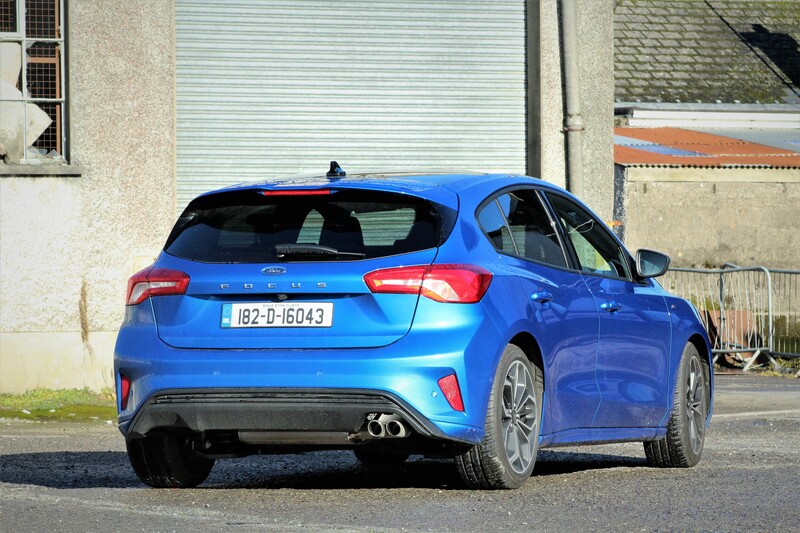 Since then, the Focus has been one of the biggest selling models for Ford here in Ireland. The Focus was quick to find its place within the market and took pleasure in putting it up to the strong competition in the segment. 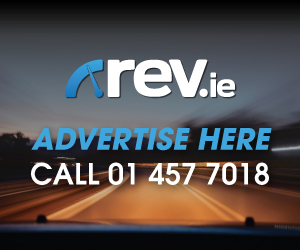 As the demand for SUV’s in Ireland and further afield continues to expand, the launch of a new small family car is a brave move, but one which Ford are confident in. 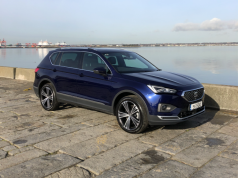 Even as the trend towards SUV’s has continued, the Focus constantly finds itself in the top 10 for car sales in Ireland highlighting the support that they have within the market. The all new Ford Focus is just that, all new. This new Focus has been based on a completely new platform resulting in an extended wheelbase and greater interior space. 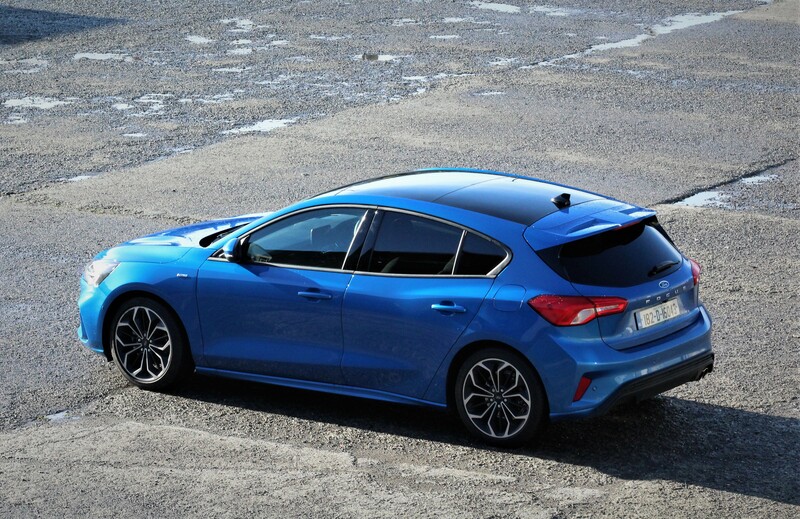 At first glance, the new Focus certainly strikes a sporty poise and is the most aerodynamic in its class. The ST-Line trim of my test model adds to the sporty appearance. ST-Line trim adds the ST-Line body kit, automatic lights and wipers, front LED fog-lights, pre-collision assist, lane keeping alert, cruise control, sports seats and trim as well as the ST-Line flat bottom steering wheel and sports pedals, sports suspension, push button start and selectable driving modes. 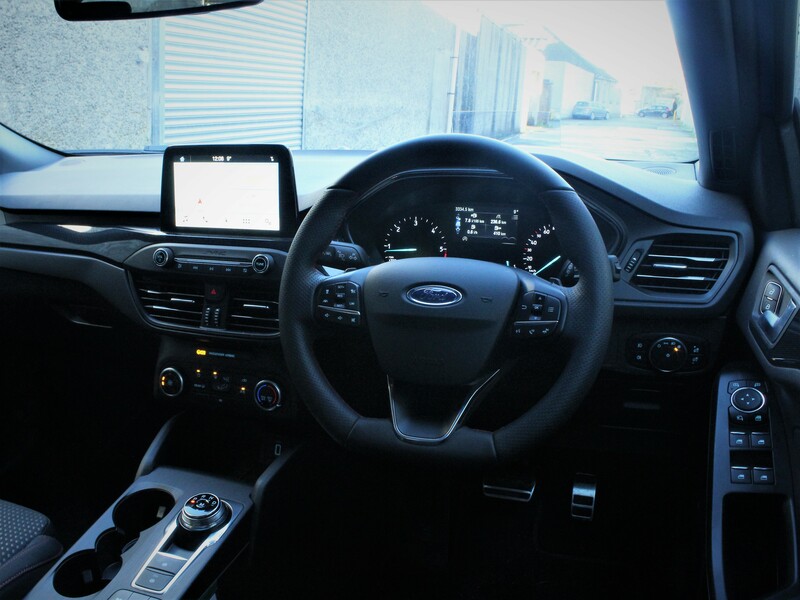 My test model also benefitted from several optional extras including 18-inch “Katana” alloy wheels, 8-inch SYNC 3 touchscreen with navigation, Ford Co-Pilot 360, openable panoramic roof, wireless charge pad, head-up display, blind spot warning, privacy glass and enhanced parking assist. With the sporty appearance on the outside, the interior is very welcoming. 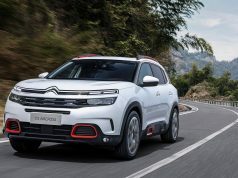 The interior design has been simplified with an 8-inch touchscreen commanding most actions within the cabin along with the reliable dials for heating controls. Interior space has benefited from the new platform design resulting in better legroom and increased shoulder room in the rear. The addition of the sports seats in the ST-Line trim improves the comfort levels up front also. Boot space stands at 375 litres to the rear shelf with the seats in place. This expands up to 1,354 litres with the rear seats folded down. One of the biggest positives that I have found with the Focus over the past twenty years is the driveability and the handling. In its segment it is simply class leading. The new Focus certainly does not disappoint. The 1.5 diesel engine in my test car performed excellently over the course of the week. 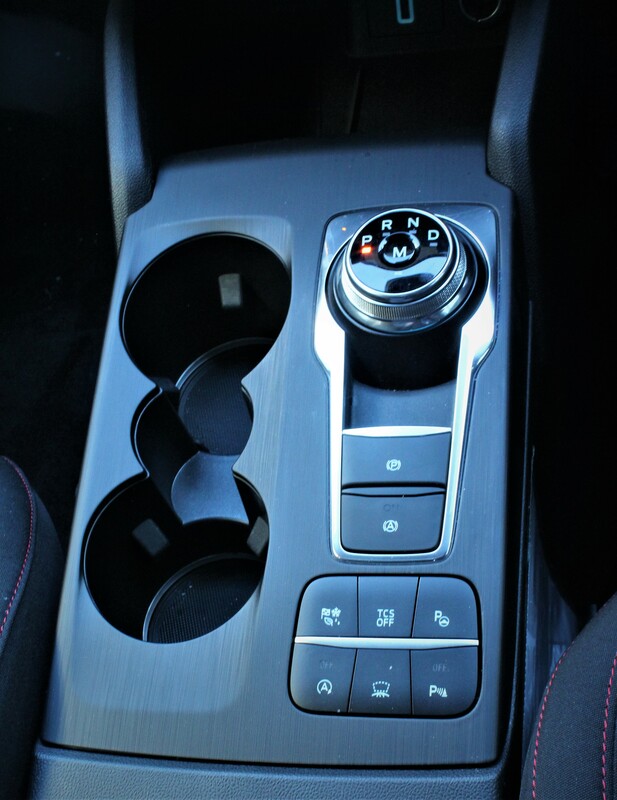 This was paired with an 8-speed automatic transmission. 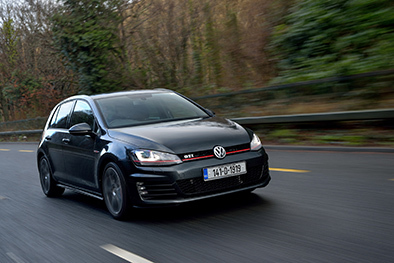 The diesel engine responds well under all driving conditions whilst the 8-speed transmission is perfectly mated and responds relatively quickly even under brisk acceleration. As with all the Ford Focus’s which gone before it, this fourth generation Focus handles brilliantly. 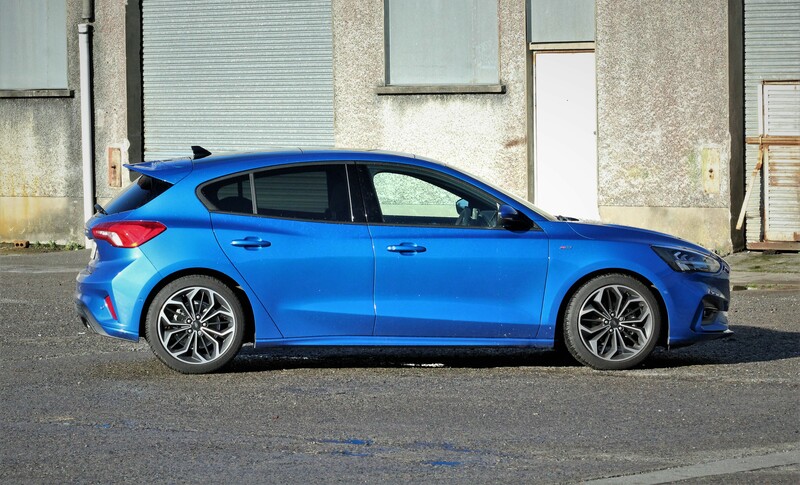 The sports suspension in the ST-Line trim adds a little extra poise in the corners. The steering is light enough to tip around town and yet offers enough feedback and weight to ensure you confidently continue through every corner. The new Ford Focus is awash with new technologies also. One of these systems is Ford’s Adaptive Front Lighting System with Predictive curve light and Sign-based light which for the first time pre-adjusts headlamp patterns for maximum visibility before reaching a curve, junction or roundabout, using the forward-facing camera to monitor lane markings up to 65 metres ahead and detect roundabout, stop, give way and yield signs. The all-new Focus also offers Glare-free high beam that removes the guilt of accidentally dazzling other drivers and helps users see more of the road ahead at night. 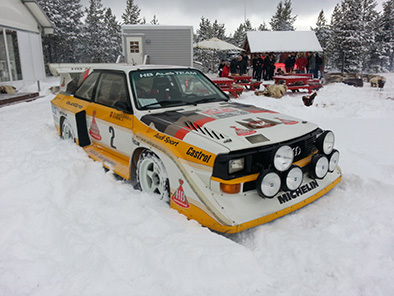 There are plenty of new lighting technologies out there but this one is up there with some of the best. 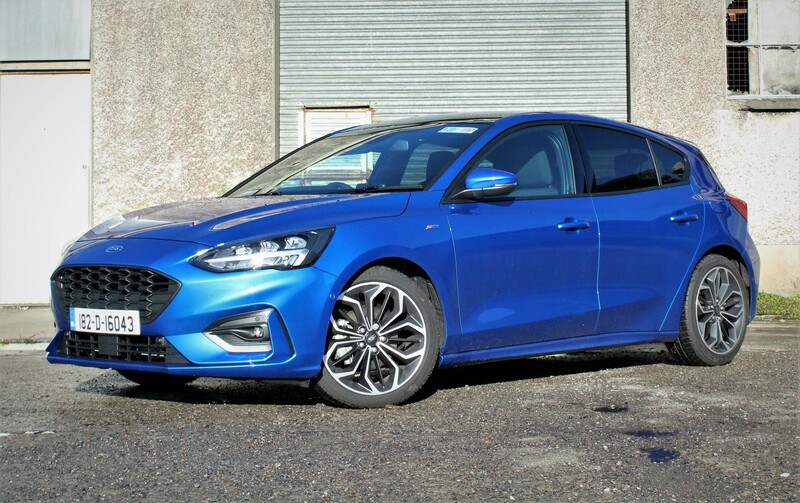 Overall the new Ford Focus has not disappointed. 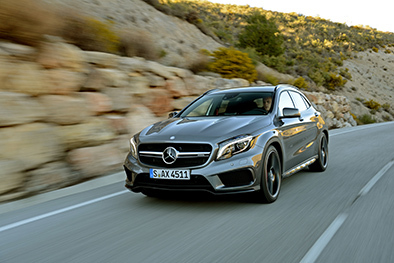 It continues to offer excellent comfort along with some of the best driving experiences in its segment. 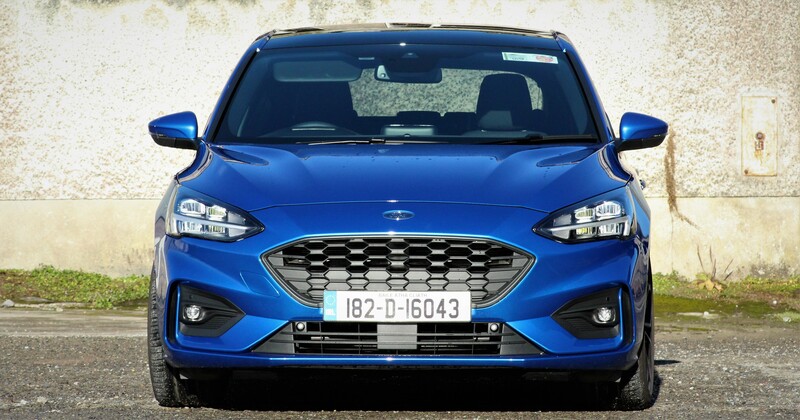 The new Focus should be considered if you are in the market for a small family car. 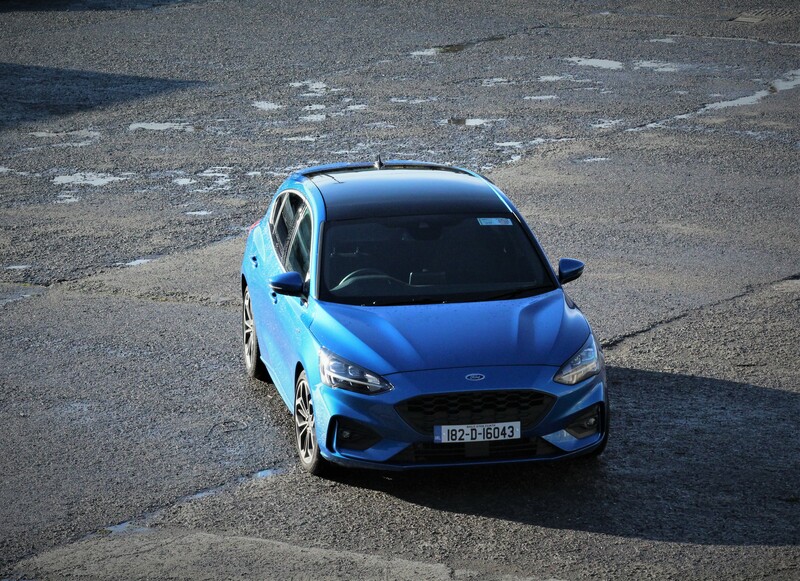 The new Ford Focus was also a very deserving category winner as the Irish Small / Compact Car of the Year 2019 fighting off some stiff competition. Этот интересный веб сайт со статьями про https://yujin.com.ua.